When a dog drops a tennis ball into a Prairie Dog hold, it travels down, down, down to their home. Once they've overcome their fear, the Prairie Dogs begin to collect the fuzz from the ball to adorn themselves. When word of this gets out, more prairie dogs come in search of fuzz, and a fight begins. The fight is ended by the largest of the Prairie Dogs, Big Bark, as he takes all of the fuzz to adorn himself. Just as the prairie dogs are about to get mad at Big Bark, Eagle swoops down and picks him up by the fuzz to carry him off. Big Bark then uses his loud bark to scare the eagle and protect the other prairie dogs. 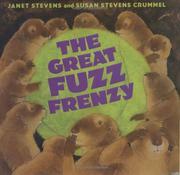 Stevens, Janet & Grummel, Susan Stevens, “The great fuzz frenzy,” Children's Picture Book Database at Miami University, accessed April 25, 2019, https://dlp.lib.miamioh.edu/picturebook/items/show/13815.